For all web payments and payments made through the card reader, the per transaction fee is 4.9% + 30 cents. For manual payments entered in by an administrator through the Dashboard or using the mobile app, the per transaction rate is 3.5%. Your supporters have the option to cover that processing fee for you. If all your supporters cover the fee, which a high percentage of donors do, you’ll pay no transaction fees and have cost-free fundraising, and your effective rate is 0%. What usually happens: about 80-85% of your supporters will opt to cover the fee, given the option. This results in about 1.1% effective rate. If all of your supporters don't cover the fee, your effective rate is 4.9% + 30 cents. This is rare, unless you don't give them the option to cover it. 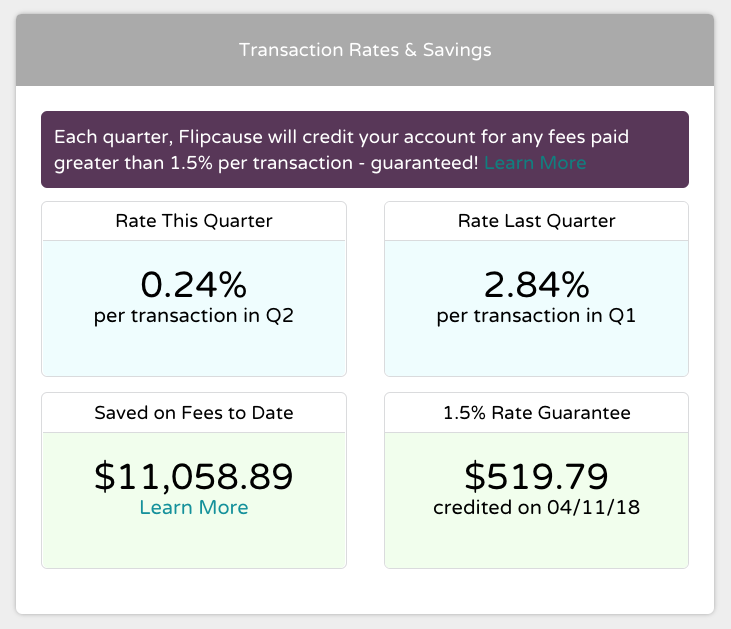 But if you do give them the option to cover the fee, and your effective rate ever goes above 1.5% effective rate in a calendar quarter, Flipcause will credit your account back for the difference at the beginning of the next quarter. This is what is meant by our Guaranteed Effective Rate of 1.5%. This Guaranteed Effective Rate will apply as long as you are giving your supporters the options to cover that processing fee. Note that this guarantee does not apply to manual payments. Please review our processing fee structure on our site here - flipcause.com/pricing. You can also see transaction rate information on the Home page of your Flipcause Dashboard under Transaction Rates and Savings.